Arequipa is located at an altitude of 2325 m in the desert mountains of the Andes. This beautiful city is practically completly built out of sillar, a kind of white volcanic stone. This is why Arequipa is called the White City. With its one milion inhabitants, Arequipa is the second biggest city of Peru. The main square, the Plaza de Armas is the most beautiful of the country. The magnificent Catedr�l and the shopping malls are in colonial style. It is the city of eternal Spring. There are two theories about the origin of the name Arequipa. Long ago the Aymara Indians founded on this place a settlement. In their language, Aymara, "ARI" stands for "summit" and "QUIPA" for "laying behind". Indeed, the majestic volcano "el Misti" is seen from Arequipa. The second theory says that the name comes from the language of the Inca's, Quechua. The legend tells the story of Inca Mayta Capac, the fourth Inca, travelling through the valley. 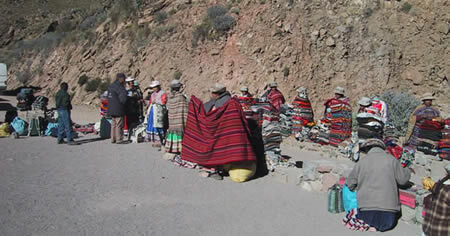 A column of militaries, sacred virgins and nobles escorted the Sapa Inca. Mayta Capac saw the settlement that was never before visited by any emperor. He was amazed by the beauty of this place and the strategic importance as a connection between the ocean and Cusco in the center of the Andes. He said: "Ari, quipay!" translated as "Yes, stay!" This was the answer on the desire of some of the fellow travelers the settle down on this place and to develop the area as an important city in the Inca empire. Arequipa was totally destructed in 1600 by a heavy earthquake and volcanic eruption. The Spanish reestablished the city on the 15th of August 1540. This date is still remembered by festivities in and around Arequipa with carnivals and fairs in the evening during one week. The climax of the festival is on the 14th of August with a splendid firework on the Plaza de Armas. El Misti (the Gentleman) is not the only volcano around Arequipa, but the most famous and elegant and in the middle of two smaller volcanoes, the "Chachani" (the Beloved) and the steep "Picchu Picchu" (the Top Top). The pressure between the tectonic plates of Latin America and the Pacific created some memorable dates in Arequipa. In 1687 and 1868 earthquakes destroyed almost every building in the city. Also the Catedr�l and the San Francisco church were pretty damaged. The biggest part of these churches date beyond 1868. The renovation of the Catedr�l finished in 1898. This is maybe why the church looks quiet cool inside in comparison with other cathedrals in Peru. 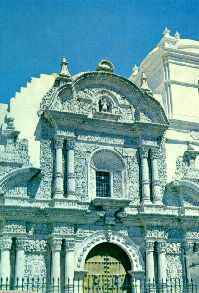 The Catedrál looks impressive from the outside in the in Peruvian so beloved baroque style. A church that peculiarly offered a lot of resistance against the earthquakes is "la Compa��a". It is unknown when this building was established. Above the entrance hall we read 1698, but other parts of this Jesuit church date from 1654. Because of its odd style we recommend to visit this church. Don't forget to leave you footprints in the Ignacio-chapel as well. "La Compa��a" is situated on the Plaza de Armas (see picture above, in the background is the Chachani volcano visible). Opening hours vary, but the best time to visit "la Compa��a" in the morning or the afternoon. By far the most interesting place to visit in Arequipa is the convent of Santa Catalina. It is built as a city in a city around 1580 and expanded in the 17th century. This is probably the biggest convent in the world. 450 nuns lived there for over 400 years, totally cut off the outside world. The inhabitants of Arequipa had no clue of what happened between the high walls of the complex. Lot's of fantasies and tales circulated under the people. Santa Catalina wrapped itself in mystery and silence until 1970 when a big part of the convent opened its doors for the public. There are still nuns living in the north area of the complex. Enjoy your Peru family vacations with us, Peru is the perfect choice to bring your whole family and have a great time! Locals and tourists with or without a guide can freely visit the remaining parts. Everything was beautifully renovated and the little streets and squares are full of colorful flowers and the walls are painted in fresh tints. Narrow alleys bring you to the different parts of the convent passing picturesque squares and odd living rooms with original furnishing. You can still smell the atmosphere of the dark Middle Ages visiting the dining hall, the square where nuns did their laundry, the washing hall and the extensive library with an incredible collection of books. Unfortunately the library is not always open to public. Some visitors stay all day and melt away in the still living past of this convent or just wonder around and lose their way from time to time. Take your time to visit this wonderful place, it'll give you lots of inspiration. The convent of Santa Catalina is situated in the street with the same name and tree blocks away from the Plaza de Armas. Next to the Rio Chili you find the Franciscan convent la Recoleta. The original building dates from 1648 and was totally reconstructed after the earthquake of 1687. Inside there is a library of more than a 20.000 books! The Franciscans are known for studying and teaching all of their life. Centuries old books can be found. The oldest book dates from 1494. They house lots of works of art from before and after the era of the conquistadors and can be visited. Indians made parts of these objects and brought by missionaries working in the rain forest. La Recoleta can be visited daily from 9am to 1pm and from 3pm to 5pm. 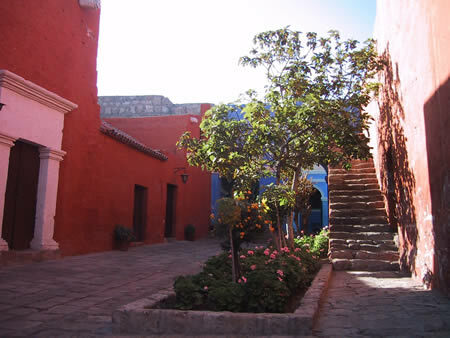 Besides of religious buildings, Arequipa owns beautiful colonial houses form the 17th and the 18th century. Some of them are still private property; most of them are sold to banks or to reconstructed to shopping malls and hotels. Some of these fantastic colonial houses can still be visited. Pay special attention to the perfect workmanship, the gardens and the many statues and frontons. Eternal snow is seen on the summits of "el Misti", the "Chachani" and the "Picchu Picchu". The coast is only two hours west and in the east you'll find the surrealistic volcanic area of Arequipa. In the national park of "Pampas de Ca�ihuas" graze lots of lamas and alpacas. The guanacos and vicu�as are also part of the scenery. So every visitor can see the four camel-like animals of Latin America in one day. This endless plateau is situated at 3.800m and more. Views are spectacular. Passing a small mountain village Viscachani on 4.500m, the road continues climbing to an altiplano of 4.800m where little grows. The main vegetation are a very tough grass that grows 2 cm a year and a brown-like moss that grows peripherical. This is what the few animals adapted to these heights get to eat, the vicu�a and the lama. Passing this altiplano brings you into a valley where the road goes spectacular downhill to the mountain village Chivay. This place is the biggest town of the Colca Valley . Hotels and restaurants offer beds and food. Next to Chivay are the warm water springs of natural volcanic heated water. Approximately 600 years ago the Incas used this water to heal all kinds of skin diseases because of the green sulfur in the water. A simple but ingenious system of canals brings the water at a surface temperature 72�C to big swimming pools at 38�C. Swimming in this water is a relaxing and recommended experience while watching to huge mountains on the other side of the Colca River. So don't forget your swimsuit and towel on this trip. Chivay is situated on 160km east of Arequipa and is the beloved resting-place to many tourists going to the Colca Ca�on. In the area the people are proud to call this valley the deepest in the world: a mountain ridge of 3.200m from summit to river. But this canon is visited by many to encounter the biggest bird in the world: the condor. Although this species is endangered by extermination, the occasion actually seeing a condor is reasonable. These vulture-like birds hunt in the morning or late afternoon. Most condors are between December and March at the coast because of the rain season in the Andes. On the way to the deepest place in the cañon, you'll see the mysterious Toro Muerto. This cemetery of the Wari Indians is built in a 90� steep cliff. It's hard to believe that these people brought their deaths to this place. It is even hard work for a professional climber to get there. The deaths were buried in the positions of a fetus, like all over Peru in ancient times. "Men has to leave the world as he came," said their unwritten bible. Ten km farther up the road you get to the "Cruz del Condor" where the Colca River is seen 1.200m below. On the other side of the valley is Mont Mismi situated with its summit 3.200m above the Colca. Further downstream there are actually deeper canons but these are only accessible by foot and by trained hikers with a well packed backpack. Arequipa Classic Tour 4 Days. I am under the impression that some beautiful sewing machine embroidery is made in Arequipa. Is this true? I want to visit this part of Peru as it is off the beaten track and the pictures I have seen are spectacular. Myra Keplinger, one of the initial Peace Corps Volunteers who was in Arequipa 1962-64, turned 100 years of age in April, 2007 and recalled much of her experiences in Arequipa and its surrounding villages. Now nearly blind and almost deaf, she nevertheless enjoys recalling her years in South America, working among the Quechua-speaking natives. Great website. When planning a trip with all the conforts and personalize services to Peru, send me a note officegap@yahoo.com Your Concierge. Can you please give me the address of the central post office in Arequipa, Peru? great website it gave me a lot of helpful info thanks for the info.....go INCAS!! To do nice trek in the colca canyon go with www.peruadventurestours.com we have hiking trails from 2 up to 9 days in ths second deepest canyon in the world. Peru Biking Tours is an independent experienced and certified tour operator, Mt. biking, XC biking, downhill, uphill, rent a bike and long trip biking around Peru. on the top where is said population it is million and not milion and it is not Chanchani it is CHACHANI.